It's a bold new frontier for Carol Danvers, soaring to ever greater heights as the leader of the all-new Alpha Flight space program! Yup, Alpha Flight - including classic favorites Puck, Sasquatch and Aurora! As Earth's first line of defense, Carol and her team aim to protect the planet from extraterrestrial threats. But can Carol be both a soldier and a diplomat? Don't ask Tony Stark! These two old friends are about to face off as bitter enemies in an event that will change Captain Marvel's life forever! As Inhuman visions of the future kick off a second superhuman civil war, Captain Marvel is at the forefront of the conflict - with Iron Man now her implacable enemy. But when tragedy hits close to home, how far will Carol go to protect what she believes in? 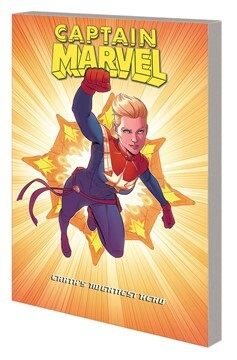 Collecting CAPTAIN MARVEL (2016) #1-10. Rated T+.